Former highbrow theatrical director turned filmmaker Damien Cockburn (Steve Coogan) is in trouble. 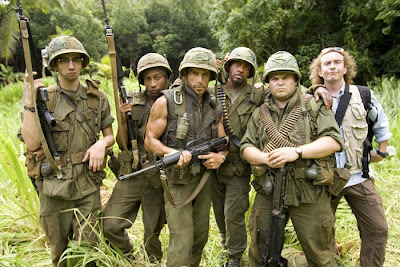 When the explosives expert (Pineapple Express scene stealer Danny McBride) working on his big budget Vietnam epic film debut misinterprets Cockburn’s temper tantrum for a cue, four million dollars in explosives are wasted, everything is blown to smithereens, and the worst thing is that the camera wasn’t even rolling. Unable to control the actors on his set and already one month behind schedule after just five days of shooting, the British thespian is soon punched in the face very hard by a grip, upon orders shouted via webcam by sleazy studio boss Les Grossman (a hilarious and nearly unrecognizable Tom Cruise). However, shortly after depositing his cast of five diverse leads deep into the heart of the jungle in order to show his pampered actors he’s really running the show, things go terribly, shockingly wrong. And soon enough the cast find themselves in a real life mini-war of their own when instead of guerilla filmmaking, the men become the target of heroin-trafficking guerillas who’ve mistaken them for DEA soldiers (yeah, I didn’t get that either). Obviously, this proves to be much more than the actors can handle, as they’d signed on with their contractual clauses for perks like gift baskets, TiVo, and luxury items, only to find themselves dodging bullets instead. 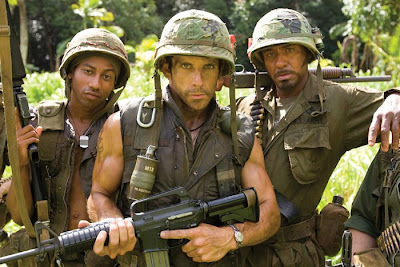 Heading up the group is Tropic Thunder’s director and co-writer Ben Stiller as Tugg Speedman, a has-been, Rambo-styled action star whose most recent film wherein he played a mentally challenged character — Simple Jack — not only ruined his career but was also named one of the worst films of all time. With his barefooted agent (Matthew McConaughey) behind him, Speedman tries to get back into Hollywood’s spotlight but is worried he’ll be upstaged by his costar, the five time Oscar winner Kirk Lazarus (Robert Downey Jr. channeling Russell Crowe), an Australian method actor so committed to his craft that he underwent skin pigmentation surgery in order to play an African-American for Cockburn’s film. While admittedly it’s a risky move to play “blackface,” Downey loses himself completely in the role. He’s a tongue-in-cheek marvel the entire way; vowing to stay in character until he records the DVD commentary track, he immerses himself in a sort of Black Power homage to '70s stars like Richard Roundtree in a way that makes one giggle even before he opens his mouth to deliver another questionably politically incorrect line. Of course, this is much to the chagrin of the cast’s real African-American actor, Brandon T. Jackson’s Alpa Chino. Still annoyed that the only good black role in the film was given to “Crocodile Dundee,” Chino, who hopes the film will up his credibility from just peddling his soft drink Booty Sweat, doesn’t let him get away with anything, especially when Lazarus lectures him about the “n word” and Chino calls him out on quoting the theme song from TV’s The Jeffersons. Rounding out the group is Jack Black’s troubled comedian Jeff Portnoy. Much like the other characters we first meet in a series of fake trailers preceding the film, Portnoy is hoping the film will prove his range as well, since he’s mostly known for his drug arrests and overly flatulence-based humor starring in Eddie Murphy-like comedies with titles like "The Fatties: Fart 2". However, when his drug stash gets lost amidst the chaos of their new surroundings, he begins to suffer from withdrawal in a series of escalating scenes with range from disgusting (trying to eat an animal who ingested his last supply) to hilarious as he orders the men to tie him to a tree when they realize they have to storm the drug dealer’s compound in order to rescue Speedman who erroneously assumed this was all part of the movie. Why tie him to a tree? So he won’t do all the heroin in sight, Portnoy explains in a twisted but freakishly logical speech. Of course, there’s the obligatory straight man played by likable Jay Baruchel as Kevin Sandusky but he’s mostly ignored by the hammy antics of our leads. Filled with Hollywood in-jokes, the film at times feels like an overly long Comedy Central roast of the industry, as each character gets to exorcise their demons and impersonate those they’ve encountered in Tinsletown. And while — much like the funny but uneven Zoolander — there’s enough good stuff involved to keep you interested, you can’t help thinking you’re watching a series of skits that were awkwardly stretched into a feature length film. From the ads, one would assume that Downey is the highlight and indeed, of the main cast, he’s the one we can’t take our eyes off of, managing to show his chameleon-like nature and astronomical depth following turns in Iron Man, Charlie Bartlett and last year’s brilliant, underrated Zodiac. However, this being said, the true revelation of the film is none other than former couch jumping Scientologist poster boy, Tom Cruise. Yes, you read that correctly — as the smarmy, amoral, balding, bespectacled, gold chain wearing, chest hair revealing, profanity driven studio head who likes to freak dance to Flo Rida, Tom Cruise all but steals the entire film away from everyone else. In fact, it’s similar to the way that Ben Stiller guest starred in one of Mission Impossible 2’s best spoofs (included on the DVD) as Cruise’s obsessive stunt double. Playing it ridiculous couldn’t have been a better professional decision for Cruise, given the scathing media attacks and popular opinion backlash over the past few years. Additionally, he reminds us again, just how good he can be when he isn’t preoccupied by arguing with Matt Lauer or criticizing Brooke Shields. While it’s safe to say his role is a composite of many types, as are a majority of the characters featured in the film, Grossman’s overreliance on Diet Coke did make me recall that it’s also the beverage of choice of a certain former head of Miramax (although, like Cruise’s characterization, I’ll let you do your homework in discovering the identity). 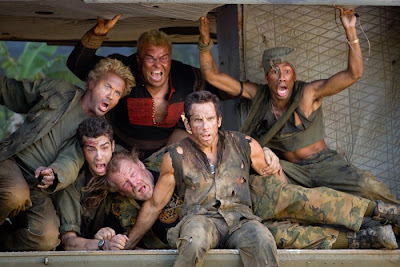 As far as his directorial career goes, it’s Stiller’s most ambitious film and it’s certainly impressively executed as it begins with an outstanding sequence that pays homage to the film’s greatest influences, Apocalypse Now and Platoon. However, it’s also guilty of Stiller’s comedic tendency towards “everything and the kitchen sink,” in trying to squeeze in far too much, preferring quantity over quality. Ultimately, I realized the film may have been better off if it had either dropped his character altogether or blended his with the underused Baruchel or Jack Black’s, in order to make the comedy more consistent and strengthen the storyline. 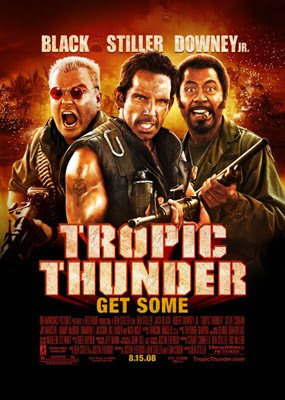 And while on the surface, that may seem like a crazy idea, in the words of Downey’s memorable Kirk Lazarus, “Crazy’s better than nothin’.” Fortunately, while not nearly as hilarious as most critics would have you believe, Tropic Thunder is elevated far above “crazy” or “nothin’,” thanks mostly to the always memorable Downey. However, the real saving grace is again in the surprisingly hysterical turn by Cruise that actually kept viewers in their seats during the credits to see him continue to dance with the most joy since he slid through the entryway in his socks in Risky Business.